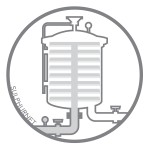 The system is composed of a vertical tank, which contains a number of horizontally positioned filter plates. The fluid to be filtered is passed over the filter medium positioned between the filter plates. 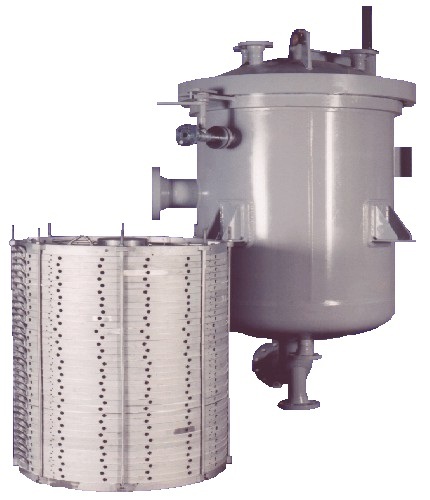 The collected solids in the form of a filter cake remain on the filter medium and the polished liquid flows through the filter plates to the filtrate outlet. 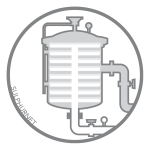 Housing: Tanks and all wettable parts are available in carbon- and several grades of stainless steel. Internal with rubber-, PVDF- or other elastomer-linings. For sanitary applications, a fully electro polished construction is available. Filter plates: Available in 316 SS, polypropylene, PVDF and Hastelloy. Quick closures: Quick cover closures can be operated or utilized with hydraulics for automated processes. Beneficial for applications with both high and low pressure operations. Heating possibilities: Conventional heating jackets, the half pipe system or the Therm-Plate system. SQL (China) SA-1210 (Australia) and other codes stipulated by the client. Fittings: Flanged connections are in accordance DIN, EN, ANSI Threaded connections to any desired specification. 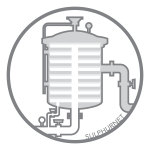 The standard Horizontal Plate Filter is designed for batch wise filtration without leaving a heel. This is accomplished with a specially-designed scavenger plate that filters the heel remaining in the tank at the end of a batch. In addition, complete product recovery can be obtained by washing or drying the cake. Designed for applications allowing the use of synthetic cloth or wire mesh filter media. The advantage to this filter is that the cartridge can be cleaned without disassembling. Cartridges are cleaned by removing them from the tank, pivoting them on a frame (leaving the plates in a vertical orientation), and cake removal by vibration, tapping or washing off. 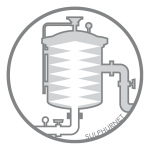 Wash off Filters can be fully automated and the filter cake can be removed in the closed position. For a slurry cake discharge, a sluice system will be implemented. Combines the advantages of horizontal plate orientation with clean filter tank operation. In this model, the contaminated fluid is pumped into the filter through the centre column, and is then evenly distributed to the filter plates for filtration. After this, the clean fluid flows into the tank and out a drain. All filter cake or solids remain inside the cartridge bundle. Offers double the filtration area compared with standard Horizontal Plate Filters. It is an ideal solution for processes which require the removal of all traces of fine solids in continuous processes with a high flow rates. A large filtration area in small space coupled with low operating cost. It offers greater economy than “one time use” cartridge. Retention is down to 0,5 micron. All types of commercially available filter media can be used and process operation temperatures can be as high as 350°C.